We knew that for Mend Our Mountains: Make One Million, we had to go bigger, better and more exciting. Our target for crowdfunding is now a whopping £150,000 (and we hope to raise it even higher if we’re doing well). Obviously, this is only 15% of the total – but it’s a big deal for lots of reasons. Mainly, it’s our best opportunity to show Mend Our Mountains to the widest possible outdoor audience – so make sure you donate, share, and tell your friends. We don’t just want to raise cash – we want to inspire a more considerate, responsible kind of outdoor user. An amazing and unique experience in the Yorkshire Dales - fly in the helicopter that takes stone to the project site. Photo: Adam Long. It’s not just the totals that are bigger. We’ve partnered up with organisations great and small – from retailers and manufacturers to charities, magazines and national park authorities – to bring you an eye-watering selection of gear, clothing, experiences, discounts and other 5-star goodies. There’s something for almost every taste and budget – from £10 to £1000. Many of the experiences are almost unique – fancy a ride in a helicopter lifting stone up a mountain, or the chance to star in your own drone-shot outdoor film? At the other end, there’s a great quality T-shirt with a design from acclaimed artist Tessa Lyons, plus a beautiful bone china mug and other great little gifts and small items. 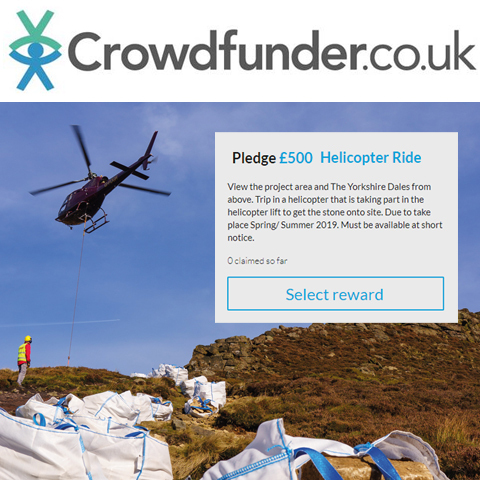 Like in 2016, with crowdfunding you’ll be able to choose exactly where your money goes – if there’s a project or National Park you really care about, you can donate to that one (and many of the rewards you’ll receive are local too). If you’re not sure, you can donate to the big pot – this will get shared out equally amongst all the projects at the end of the campaign. 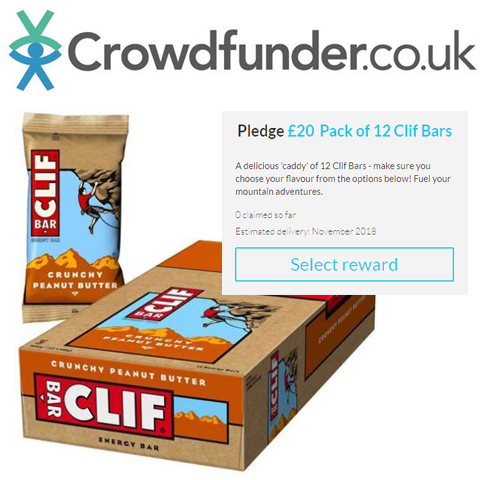 Fancy a Clif bar or 12? We've got box loads to give away when you donate. Mend Our Mountains: what's it all about? Mend Our Mountains: Make One Million is coordinated by the BMC and its charity, the BMC Access and Conservation Trust, and run in conjunction with a coalition of over 25 organisations, including all the UK’s National Parks, major businesses and charities, and local user groups. 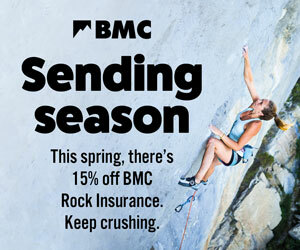 Headline sponsorship is generously provided by Cotswold Outdoor and Snow+Rock. Erosion is a growing problem in Britain’s hills and mountains as visitor numbers grow and the budgets of National Park Authorities and other relevant bodies shrink. Repeated footfall causes the ground underfoot to erode, creating ugly scars with the potential to seriously damage the surrounding environment. The costs of sourcing materials, airlifting stone to remote locations and paying for specialist contractors can push the cost up to as much as £200 per metre. The campaign launched to the public in March 2018 and will run until March 2019. It is comprised of thirteen ‘primary’ projects in eleven UK National Parks and focuses on some of the most popular walking destinations across Britain, aiming to turn heavily eroded trails into sustainable routes for future generations to enjoy. Mend Our Mountains: Make One Million has already far surpassed the £100,000 raised by the first Mend Our Mountains campaign in 2016. That campaign funded eight projects in National Parks and used only crowdfunding to reach the required total. I am concerned that a proportion of this money is actual having a negative impact on us users. There is no doubt that footpath repair is beneficial but at the rate we are going, scrambles like striding edge and jacks rake will be stone pitched. Sounds like an exaggeration I know but there is a balance to be found and it seems to be tipping to too much intervention. The petition below sums up my feelings and hopefully if the BMC is in agreement I do not need to have any concerns. This makes me sad. Please stop it. The paved motorways do far more damage by making it even easier to walk up snowdon in shorts and flip flops. If you don't want to get mud on your boots, stay at home. Looks like a lot of comments that broke the house rules. People are unhappy it appears. @Anonymous #9 - being unhappy is not a breach of house rules (see comments 4 and 6). Posting links to questionable websites is such a breach, which is why all the other comments are hidden.